Was visiting a friend who found a set of cards in German that his dad used to play all the time. The cards in one set have "Doppeldeutsche", but I can't find anything under "Double Dutch" or "Double German". The older set of cards he has have these suits: acorn, heart, green, ball. I'm sure there is probably someone out there in the BGG community that could direct me/us to the right basic game....still searching here myself though too. It's like a basic deck of cards and so you can play several games with it. The suits are Herz (hearts), Kreuz/Eichel (clubs-acorn), Schippen/Pik (spades/leaf) and Bollen/Karo (diamond/ball). 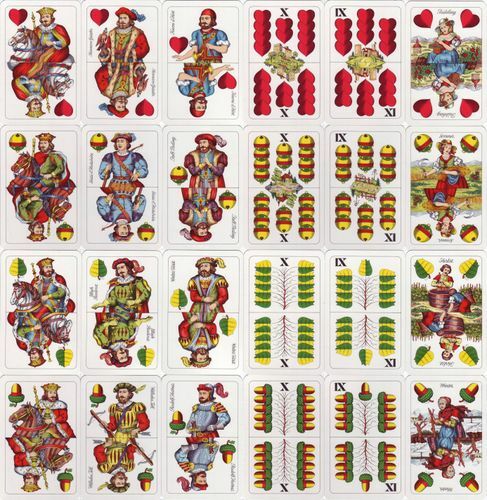 It includes As (ace), 10, König (king), Ober (queen), Unter (jack) and 7 or 9, depending on the region, but they are interchangeable. Every card is twice in the set. Common games are Pinochle, Schafkopf, Gaigel, Doppelkopf. Wow, those are exactly the same as the older set he showed me! Thanks a lot. I was thinking it was probable something like Karnöffel so I was on the right track it appears.